Downtown Nashville is never short on entertainment; it’s almost overwhelming and locals like myself often find ourselves struggling to decide which of several amazing events to go to on any given night. Last night was no exception. 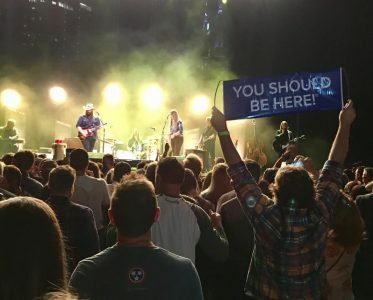 While TSU celebrated their homecoming Nissan Stadium, Adele rocked the Bridgestone; of course several smaller yet fun events were happening as well. But a local man who everybody across the country knows by name was in town and locals as well as tourists couldn’t wait to see him. 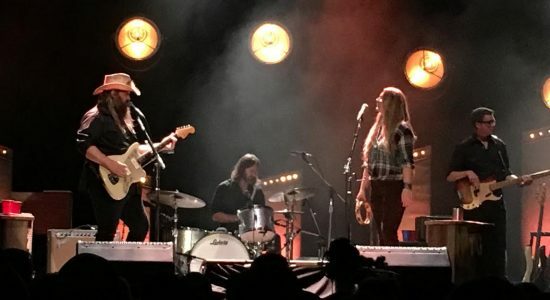 Chris Stapleton has been a name known in the music industry for many years as he has written handfuls of songs for some of the biggest names in country music. However, he became a nationally known name last year with the release of his album “Traveller”. Last time Chris performed in Music City he played the historic Ryman Auditorium and tickets sold out instantly. This time, he moved to a bigger venue- Ascend Amphitheater. The outdoor venue holds nearly three times the amount of guests and Stapleton added a second show; yet again, tickets sold out nearly as soon as they went on sale. After opener Brent Cobb wrapped up his set Chris entered the stage donning all black and his signature Charlie 1 Horse hat. He laid down an impressive guitar solo before opening with his song “Nobody to Blame” which peaked at #10 on the RIAA Us Hot country Airplay. Joined by wife Morgane and his band, he performed almost every track off his 2015 debut album “Traveller”. A simple performance with no stage effects, while remaining in virtually the same place the entire night, Chris was able to hold the audience captive for a solid hour and a half with his guitar skills, soulful voice and a few personal stories. He told of how he was once blessed with the opportunity to open for Merle Haggard; and the joint the country music legend sent him afterwards that he kept and covets. I probably ought to lay off the whiskey” which is mentioned in several of his hits. When it came time to introduce the band, he made things interesting by singing their introductions; and when he spoke of his wife standing alongside him he affectionately stated “she’s the beauty that tamed this beast”. After reading a banner a fan had made that read “Stapleton/Timberlake 2016” he joked “I don’t want the job, I like the one I got”. He closed the set with his #1 song “Tennessee Whiskey” before coming back for an encore with an acoustic version of Whiskey & You before the band rejoined him again for 2 more songs. Chris Stapleton is an insanely talented artist who doesn’t need an impressive show to captivate his audiences. If you haven’t yet had the chance to see him live, I highly recommend doing so. To find tour dates and more things Chris check out his website chrisstapleton.com and follow him on Facebook and Twitter.